The classic gospel tract by Billy Graham, available in a range of languages. 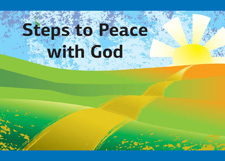 This booklet outlines four steps to finding peace with God. STEP 1: God's Purpose: Peace and Life. STEP 2: Our Problem: Separation. STEP 3: Jesus Christ is the only answer to this problem. STEP 4: Our Response: Receive Christ. A tried and trusted evangelism aid that has been in use for many years. The 16 page tract is attractively presented, staple bound in full colour on glossy paper. Wallet sized, measuring 105 mm wide by 74 mm high. For bulk orders, or if you have access to an accurate translation in another language and would like us to print it and add it to our range, please contact us.